Jacksonville, FL, May 15, 2014, Capt. 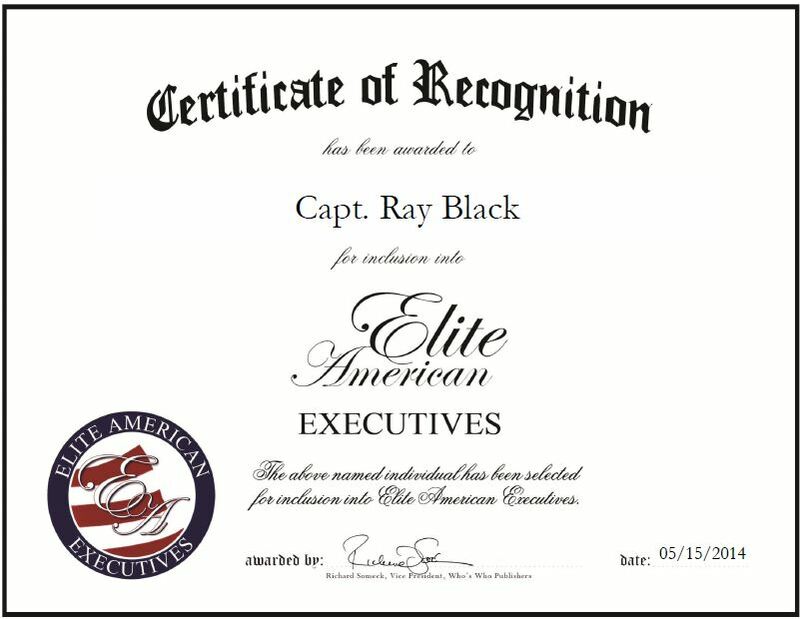 Ray Black, Founder, Chief Executive Officer, and President of CDA Technical Institute, has been recognized by Elite American Executives for dedication, achievements and leadership in training and consulting. Inspired by Jack Nelson’s Sea Hunt on television, Capt. Black joined the military to fulfill his passion for the ocean. He has worked as a commercial diver and instructor in North Sea, Singapore and other places around the world, and has nearly 30 years of professional experience. As a commercial diver, he has witnessed more than 300 needless deaths due to unsafe commercial diving practices. He decided to assist in preventing future tragedies by creating CDA Technical Institute. The goal of the training institute, which provides services in commercial diving, welding, medical assisting and hyperbaric chamber operations, and industrial nondestructive testing, is to properly train individuals in safety. CDA Technical Institute encompasses on-site dormitories for the individuals who spend five months learning everything about diving safely. Capt. Black founded the CDA Technical Institute in 1995 and has watched it become an Ivy League training center for underwater and commercial diving. It is the only school in the world that is owned and run by an actual diver. It has three locations in Ocala, Fla., Jacksonville, Fla., and Barbados, West Indies. Capt. Black has trained commercial divers and underwater welders from around the globe, and continues to share his knowledge and experience with clients. In his role, he manages the managers, oversees all school operations, and stays current with cutting-edge technology and safety regulations. He prides himself on providing the highest quality services and training the best personnel in the world. Capt. Black and his company have won numerous awards for exceptional business and training ethics. Capt. Black is a certified underwater welding specialist, unrestricted surface supplied diving supervisor DCBC/IMCA, and saturation diving supervisor, and is certified in specialty welds Europe and OPEC. To keep abreast of advancements in the industry, Capt. Black is affiliated with the American Welding Society, Undersea and Hyperbaric Medical Society, IMCA, Diver Certification Board of Canada, Association of Diving Contractors International, NCCER, and ANTD. Additionally, Capt. Black sits on multiple panels worldwide for International Offshore Diver Certification and Standards. This entry was posted in Training and tagged hyperbaric medicine training, nondestructive testing, underwater diving, welding. Bookmark the permalink.